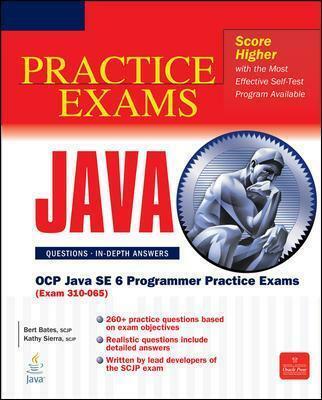 Written by two of the lead developers of the Java SE Programmer Exam, OCP Java SE 6 Programmer Practice Exams is filled with more than 260 realistic practice questions to prepare you for this challenging exam. To help you understand this material, in-depth explanations of both the correct and incorrect answers are included for every question. This practical guide covers all official objectives for Exam 310-065 and is the perfect companion to SCJP Sun Certified Programmer for Java 6 Study Guide. Bert Bates, SCJP, was a lead developer of the SCJP and SCWCD exams for Sun. He is the coauthor, with Kathy Sierra, of SCJP Sun Certified Programmer for Java 6 Study Guide. Kathy Sierra, SCJP, was a lead developer of the SCJP exam and the SCWCD exam. She was also a certified Sun Java instructor and is the founder of the world's largest Java certification website, javaranch.com.